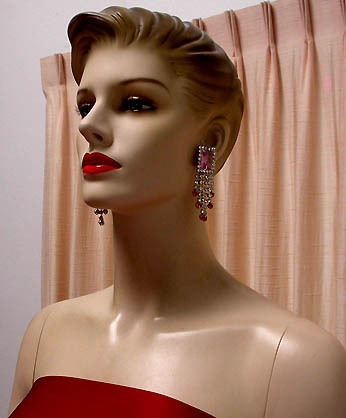 VINTAGE COSTUME ANTIQUE ESTATE JEWELRY EARRINGS! 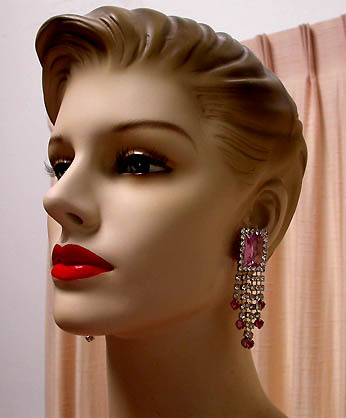 Juliana Style Art Deco Ice Pastel Pink Clear Crystal Rhinestone Silvertone Vintage Estate Dangle Chandelier Drop Clip Earrings For Weddings, Proms, Pageants And Parties! 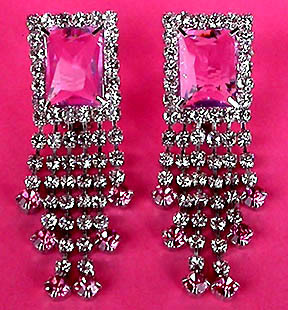 Item #E168407 - Juliana Style Art Deco Ice Pastel Pink Clear Crystal Rhinestone Silvertone Vintage Estate Dangle Chandelier Drop Clip Earrings. Size: Length: 2 7/8". Width: 7/8" at the widest point. 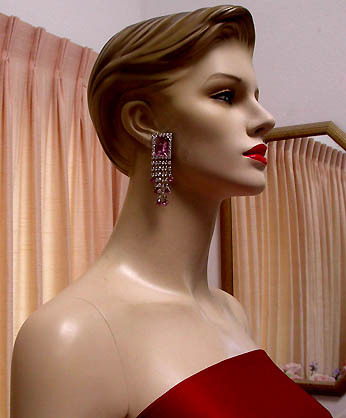 Gorgeous Juliana style Art Deco pink crystal dangle earrings! The beautiful emerald cut feminine pastel pink large rhinestone is set in an open back frame glistening like a large ice pink diamond! Framing this fantastic large pink gem are sparkling clear round crystals with six graduated clear rhinestone strands dripping down. Each strand is ending a round cut pink rhinestone to eccentuate the dripping effect! These glorious stones are all pronged in shiny silvertone metal. Art Deco and exquisite like Juliana! New old stock from the 80's in mint condition. Clip backs. Fabulous earrings for weddings, proms, parties and special functions! US$168.00. SOLD.